WASHINGTON — In the next few weeks, Lockheed Martin expects to see a preliminary report on a potential fix for a nose gear problem on the F-35C, with an eye on doing live carrier trials in the fall. The company has also recently finished doing repairs to 47 jets in various stages of production, following last fall's issue with insulation around a coolant line. 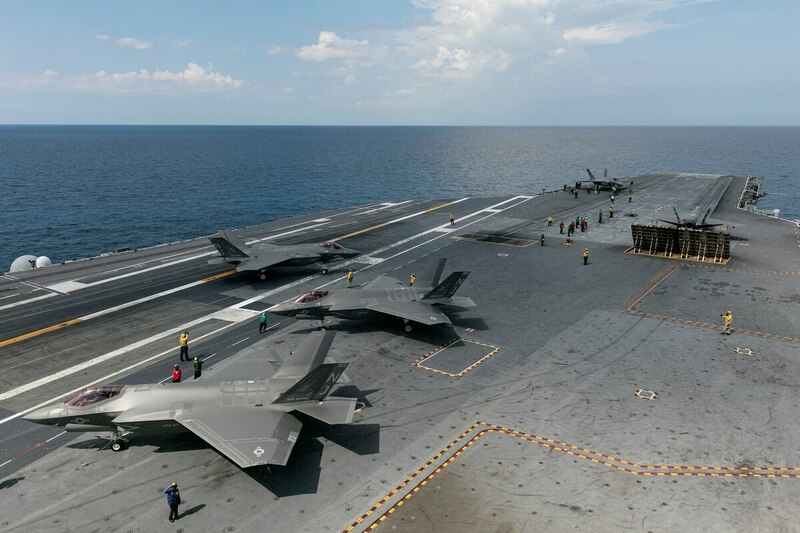 Tests conducted last year on the USS George Washington led to complaints from pilots that the F-35C model would bob up and down on its nose gear when being launched from a catapult. The issue was bad enough that pilots said they could not read instruments while trying to take flight. A number of pilots also said they experienced pain from the motion. Jeff Babione, Lockheed’s F-35 program head, told reporters Tuesday that tests for two potential fixes just concluded at Joint Base McGuire-Dix-Lakehurst, with a report expected in the coming "weeks to months." The first option involves changing the way the pilots strap into the jet, which Babione said includes looking at "how they get into the seat, how they pull their harnesses and make sure they are in proper position." The second option is looking at having "just a little bit less load holding the airplane back when it launches off the catapult" in order to reduce the stored energy in the nose gear. "Initial indications are some of those techniques have improved. Whether or not they are good enough for the operator, that has yet to be determined," Babione said, before adding he was "certain" the Navy would want to take the planes out and do live tests on a carrier, likely in late summer or early fall. While that issue is ongoing, the company has just put to rest another production issue left over from last fall. Thirteen F-35A models used by the US Air Force, as well as two for the Norwegian Air Force, were grounded in September due a problem with faulty insulation placed around coolant lines. The design of the plane has the coolant lines traveling through where fuel is stored, although only on the outer tip of the wing. The insulation placed around that coolant line to keep it from being affected by the warm fuel was found to be decomposing into the fuel. Babione would not say how much money the fixes are costing the company, but he did express relief that a creative solution involving small circular cuts in the wings meant the planes did not need to be totally stripped of their coatings. It also served as a lesson for the company to double-check its vendors. "We’ve redoubled our efforts to make sure we’re getting a quality part, to make sure nothing like this happens again," Babione said. "This only impacted 50-something jets. If the production ramp had been much higher, it would have been [more significant]."